The pros hate it when they don't birdie them because they know they've lost a stroke to the rest of the field. Most average golfers dread them because of their size. Some play them optimistically, telling themselves they have one extra shot to waste if they so choose. These long, surly holes can really bully a hacker around. Most duffers approach these holes with sweaty palms because the green seems so far off (if they can see it), and they think they have to hit the ball harder and farther to have success. Well, in the case of the following holes, that may be true. These behemoths pretty much disallow a conservative mind set. They force you to be long and accurate, and if you're lucky you'll walk away with par. The only eagle you'll come close to is the one flying by with wings and a beak. No. 7 at Grey Hawk Golf Club, Lagrange. The first thing you have to do on this 580-yard hole is fight the urge to run away. You're confronted with water immediately, which starts in front of the tee and terrorizes you all the way down the left side of the hole. "You have to carry that water off the tee to a narrow landing area," says head pro Todd Cassabella. "If you take a chance and drive over the water on the left side, you could possibly go for the green in two." Yeah, right. He then says the smart thing: "It's a true three-shot par 5." Right on. Why? Because a creek bisects the fairway 100 to 150 yards from the green, which is guarded by bunkers behind and that pesky water on the left. Lay up short of that creek and favor a short iron miss to the right as there's a dropoff on the left side of the green so steep that no errant ball has a chance of staying up. No. 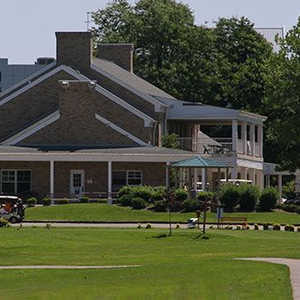 6 at Manakiki Golf Course, Willoughby Hills. This 568-yard hole lulls most people into a sense of security. The elevated tee seems to invite the devil in all of us to emerge and rip one way out there. But hold on there, tiger - the hole is tighter than it looks. Dense trees lurk on the right, and left is a red lateral hazard. Your second shot is a blind one, but aiming too far left is a better mistake than aiming too far right where more lumber awaits. The good news about the green is that it is fairly large relative to the rest on the course. The bad news is that it's riddled with tricky breaks. "This hole is true in length. It really takes two darn good pokes to get it home in two," says head pro Tom Kochensparger. "You especially have to keep it straight off the tee from the tips," he adds. No. 4 at Windmill Lakes, Ravenna. Hey, Ben Curtis has played this hole. Hopefully that knowledge will pump you up for this 567-yard beauty that has bins near the green offering free samples of Advil. Those who have been humbled by it say it's important that the second shot avoid the meandering creek down the right side. The green is very deep but it's guarded by two bunkers on the right and one on the left. Plus, from about 150 yards out, the hole gets extremely tight with trees flanking both sides of the fairway and providing a narrow opening to the green. No. 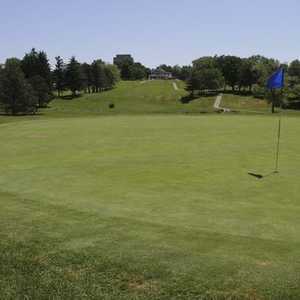 8 at Thunder Hill Golf Course, Madison. This monster, which plays 620 yards from the tips, requires a manly drive to the left side of the fairway and a testosterone-burning second shot to clear water that sits about 200 yards or so out from the green. Laying up before this water obviously leaves a long shot to a green fronted by deep bunkers. Head pro Sam Kless says golfers should think twice about being too aggressive on this hole - it's a true three-shot play. "You don't want to hit driver off the tee," he says. "You want to lay back with a 3-wood. Once you negotiate the water, it's no picnic near the green either with bunkers starting about 80 yards out on the right side. On the left is a waste bunker and more water, so you've got this neck to shoot for." The green is big enough to land an airplane on, but it slopes severely from right to left, back to front. No. 13 at StoneWater Golf Club, Highland Heights. This bad boy, at 625 yards, is the longest of the lot. Thrill seekers tee off through a narrow chute, and on their second shot have to contend with an environmentally-sensitive area that charms the eye but threatens your golf ball's life. If you make it through that zone without shattering any duck eggs, you'll have to fight 10 bunkers that lie in wait the remaining 200 yards of the hole. The small green is guarded by three of them, two in front and one in back.